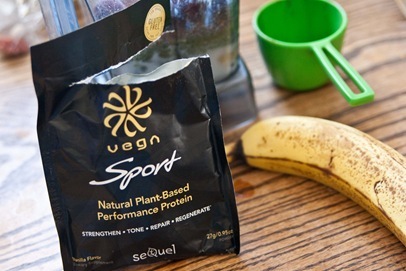 I experimented with protein powder #2 today, in my quest to find my favorite plant-based powder. Like I said previously, I don’t plan to rely on this for my main source of protein. However, my hunger has been out of control lately, and I’m testing different methods [like adding more protein] to see which works best. While this boasted 20g of protein, organic sprouted brown rice, organic pea protein, hemp protein, organic alfalfa juice protein + spirulina, it also contained stevia. My protein powder enemy! I’m not one to just mix protein powder + water together, so I thought maybe I could hide the fake sweetener taste in a smoothie. 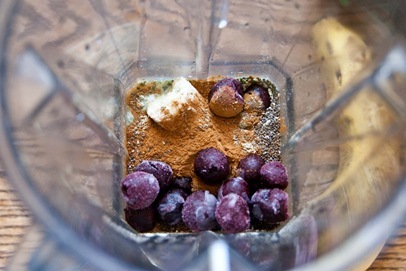 What would be a typical smoothie for me, was way too sweet with this product and had an definite stevia aftertaste. I also thought this was chalkier texture, in comparison to the Food for Life Raw Protein. I’ve also tried a few other Vega products and have unfortunately, been disappointed. My search continues. So far, Raw Protein is #1! 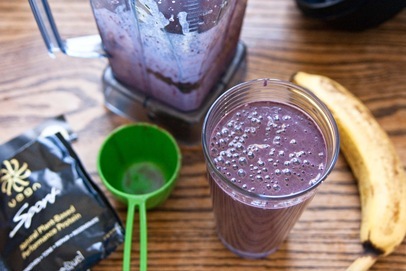 I appreciate all of your comments + suggestions on your experiences with different protein powders. It’s fun to hear what works for all of you! I ate slurped this medium-sized breakfast, because I wanted to go for a swim first thing, and then have a snack afterwards. Swimming always leaves me ravenous! It felt great to get back to the pool. I swam for 40min and my arms + legs felt like jelly after. Definitely had a little set back, since not going for over 2 weeks. Instead of putting tofu directly onto the grill, this time I decided to “bake” the tofu in the grill. 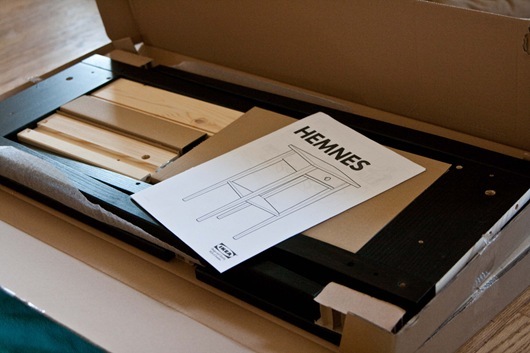 It worked fabulously! The texture was awesome! 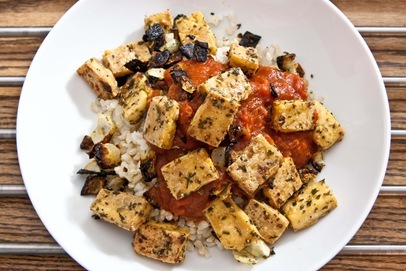 I attribute that partially too pressing the tofu for a full 20min. My method for pressing is pretty standard. I cut the block into 8 slabs, double up a towel and lay the pieces out. Then, I top with another doubled up towel and place a cutting board over top. Then I stack heavy books on top and let it sit for 20min. Pressing out the liquid really helps with the texture! Promise it’s worth it. While tofu cooked, I showered, cleaned dishes in the bathroom, and made salads. This is what our obligatory dinner salad typically looks like. Although I forgot to add the pepitas tonight! And here was our completed dinner! This was the best mock-kitchen dinner yet! 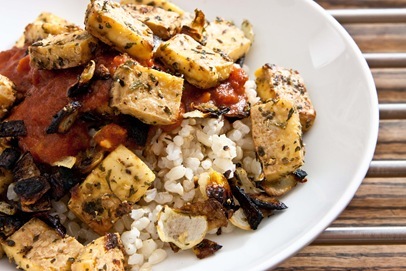 So what exactly is all over the tofu? I didn’t measure, but here are the approximations. 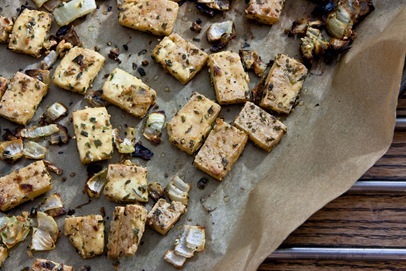 Cut tofu into 8 equal slabs and press per instructions above, for 20min. 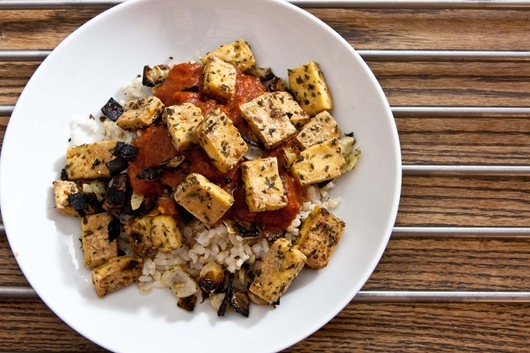 Cut tofu into cubes and place in a bowl with all other ingredients. Carefully mix, until well combined. Line a baking sheet [that will fit on your grill] with parchment paper and spread mixture in a single layer onto the pan. *Do NOT use foil or wax paper. Place pan on the grill for ~15-20min. If your grill has hot spots, rotate the pan 1/2 way through. After 15min flip a few pieces of tofu over and see if they are browned. If so, remove the pan from the grill and close the grill to keep it hot. 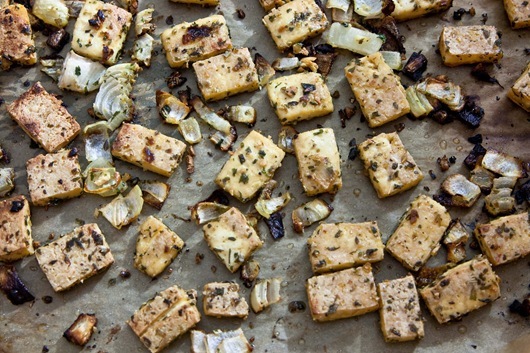 Flip each piece of tofu over. If it’s not yet browned, give it another 5min. Cook for 15-20min longer, rotating pan again if needed. The tofu wasn’t dried out at all. 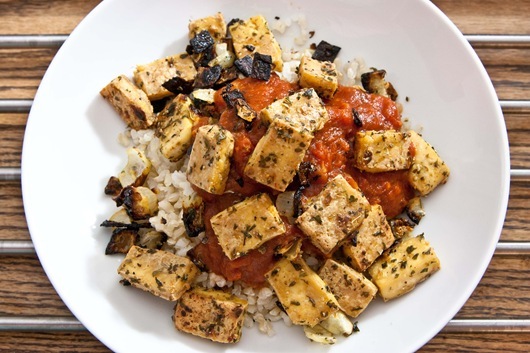 It was the best tofu I’ve ever made! 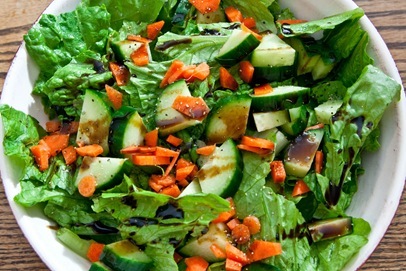 The herb mix was delicious and the crunchy grilled onions were a great addition. Fabulous kitchen-less dinner. 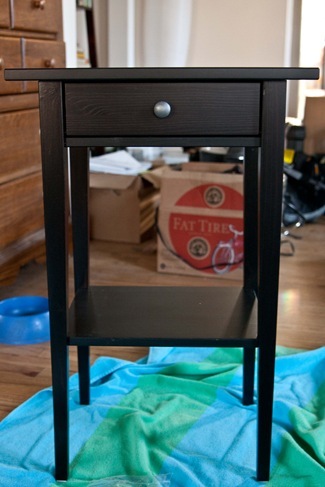 I got to work on our nightstands. 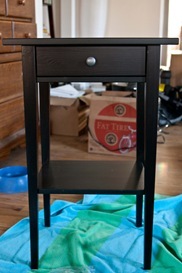 I built both in just over an hour. Booyah! After a seriously exhausting day [didn’t sit down to dinner until 9:30pm! ], this girl is ready for some serious sleep. p.s. The lovely Heather has a raffle going on, on her blog right now, that is helping to raise money for Relay for Life. The raffle runs from this Friday, April 8th, until April 16th and there are 18 prizes! The prizes range from foodie things to fashion accessories and more. For details, head on over to Heather’s blog. Thanks guys!